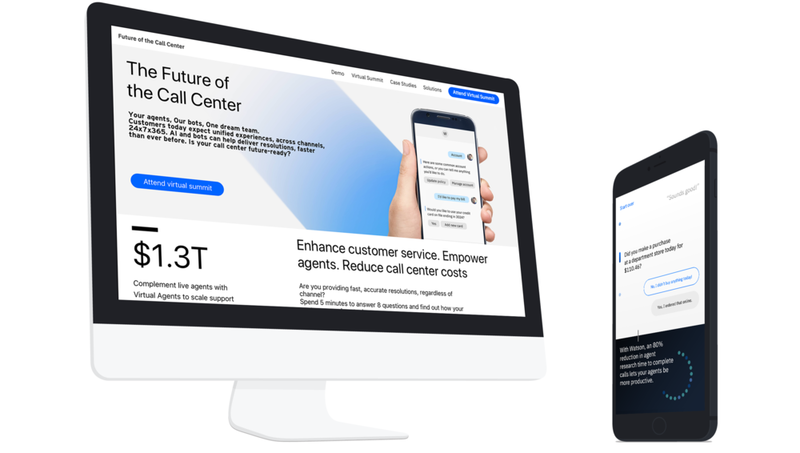 A bespoke digital experience for IBM that explored the business benefits and power of Watson's integration with the Customer Call Center. This dynamic landing page and interactive demo adapted content according to paid media traffic and industry. IBM had presented some core assets that needed to be prioritized and served, driving visitors to register and/or contact a sales representative. A customer journey was helpful in defining the optimum site narrative. Once there was a firm understanding of the best information architecture, iterations on design were made clear to client via wireframes. Heat-maps were helpful in understanding how users explore and interact with other IBM properties. The site also needed to adhere to a design language and parameters being solidified across the brand. From project KO, one key asset of the landing page was to be an interactive demo. It needed to satisfy scenarios relevant to each of four core industries, and provide annotation of both back-end systems capabilities and highlight the key business value. Scripts for each industry scenario were developed and points of interaction determined. After some exploration, we decided that we didn't necessarily want to break the format of a standard text message in order to demonstrate Watson's capabilities, but would use DUO (IBM design system) to split the screen in half. The left side is interactive, and serves an industry related scenario asking for user input in order to resolve a customer service issue. On the right side (below on mobile), two types of annotation are served. Back-end systems actions and more prominently - overarching key business value.